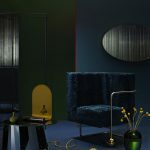 Trending International Klein Blue conquers the Interior Design world. 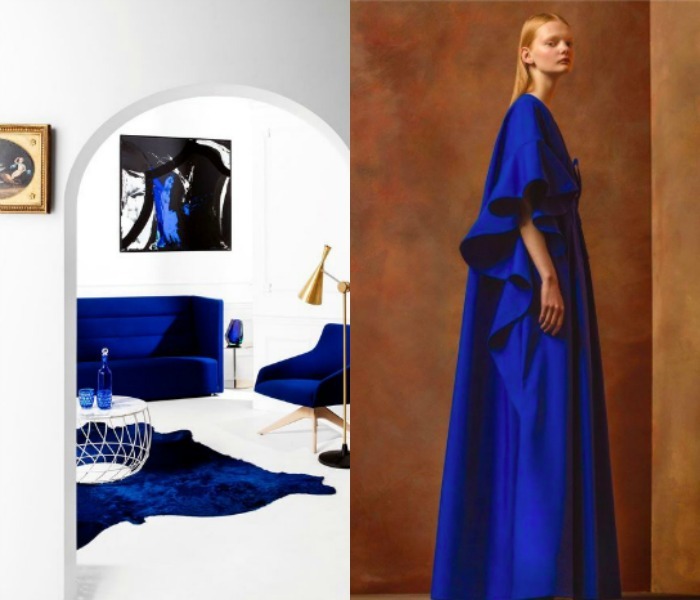 A little over a year ago we have been observing and color-forecasting the comeback of the International Klein Blue (IKB)and we see it popping up in interiors more and more. Today we have 12 examples on how Klein Blue conquers the design world with its very engaging and electrifying sparkling blue. BUT: the color is everywhere and not just in one area as you can see from our mini moodboards. 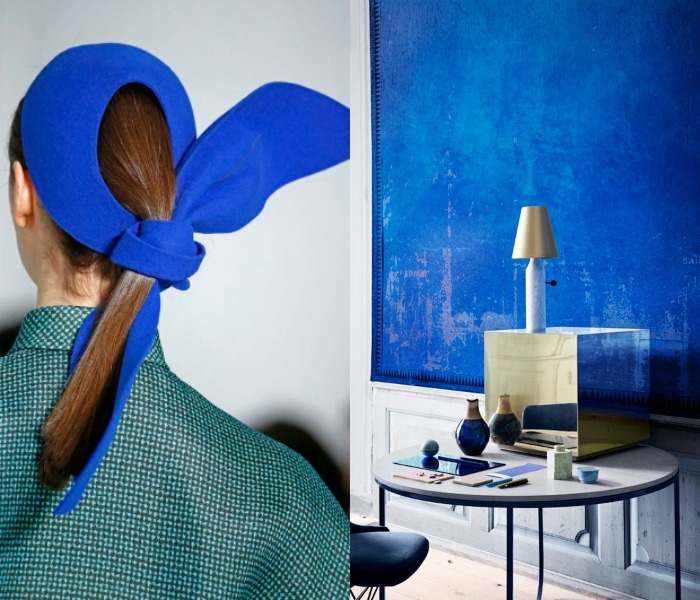 See our board to get much more Yves Klein Blue Inspiro. 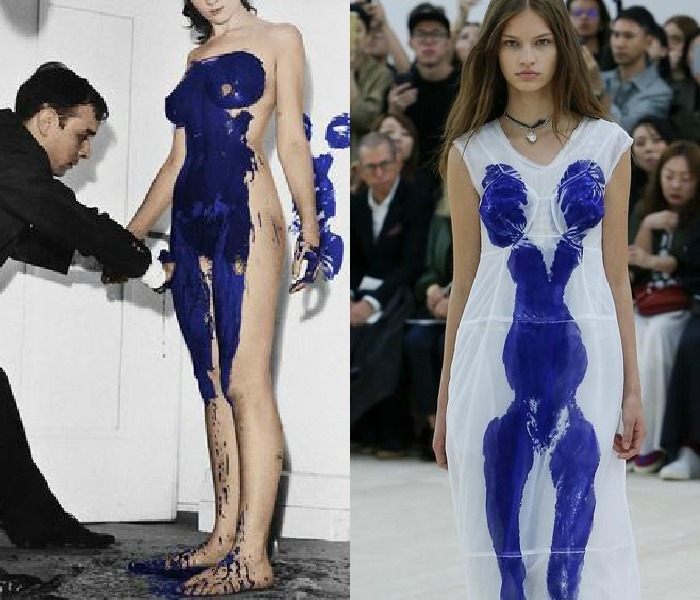 Two dresses refer to Klein’s performative Anthropometry paintings from 1960 at the actual Céline collection, where he painted the bodies of naked models in his signature color, and they imprinted patterns on paper. Céline designer Pheobe Philo put the Athropometric prints back on the body, with blue patterns complementing the female form on white frocks. In art, blue shades were often withheld for portraying royalty and religious figures, not only because it was fairly expensive to produce but it also had a very electrifying and ornate look to it. From the ancient Willow pattern, an elaborate chinoiserie decoration used on ceramics to the decorative blue painted greek houses – the love for blue is not new. 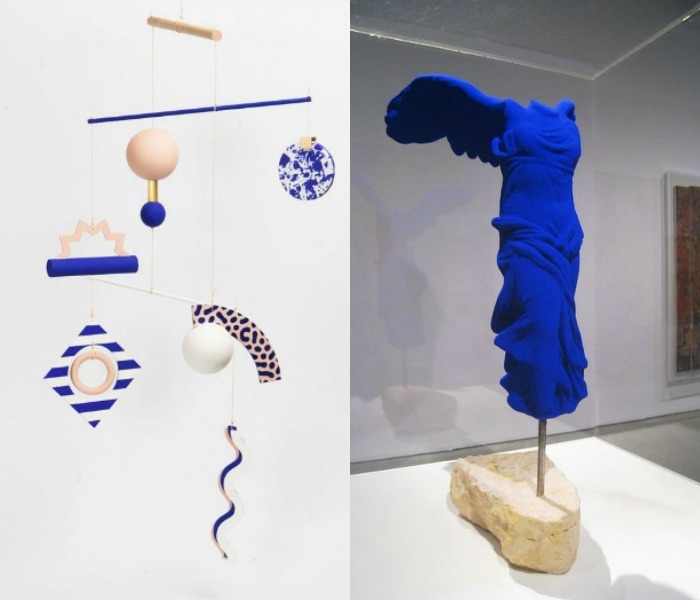 There are so many references from other time eras and cultures we could use, but it was the french artist Yves Klein who left an iconic impression for this color – later known as International Klein Blue – IKB. 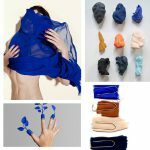 A new, but inorganic YInMn Blue color (remember this article?) was discovered and it strongly reminds of the IKB. 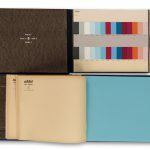 This extremely shortened history of blues is an attempt to display that it has been a favorite for artists and designers but it is, again, becoming a valid color in contemporary design. A strong connection to art can be drawn here, as it was Hans Hornemann’s, the designer of the Normann Copenhagen flagship store, initial wish ‚to give visitors the feeling they’re moving around in an art installation‘. 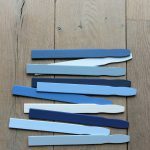 The other examples show, that the color is mostly used in the classic combination of blues and whites. Arranged in interiors the color creates a very fresh and clear look. 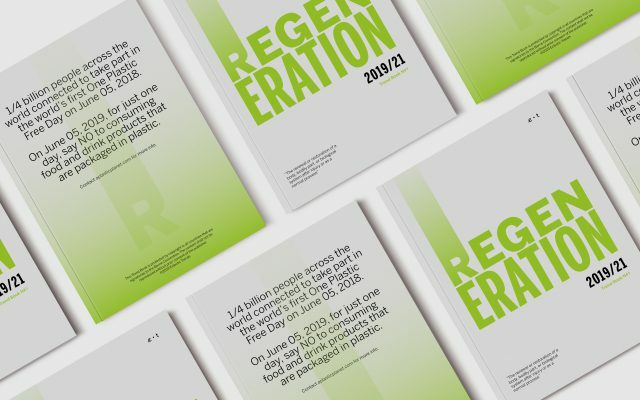 In the meantime it is a color that is mostly used in fashion and for accents in interiors, but we see a tendency for a more bolder and courageous approach as more and more tone on tone stylings begin to appear. 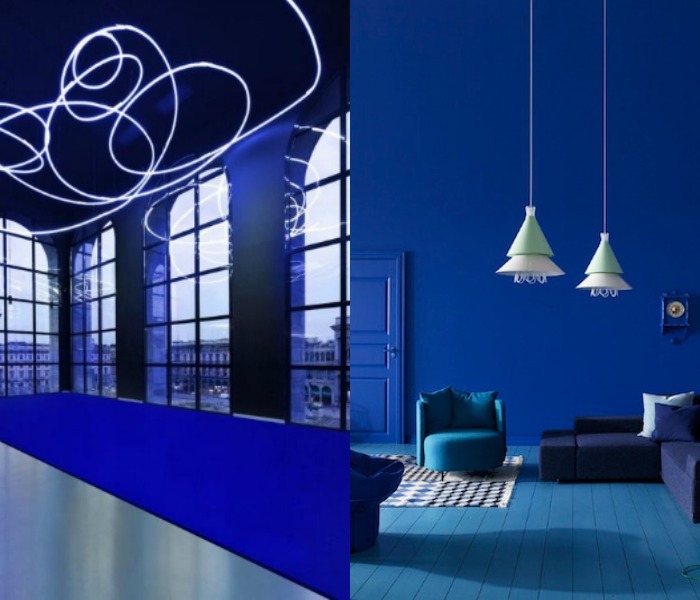 If you can’t get enough of the color blue: for more inspiration we have another gem for you, we already published a while ago – the monochromatic blue design by StudioPepe and we are excited to see what they come up with this year at the Salone. 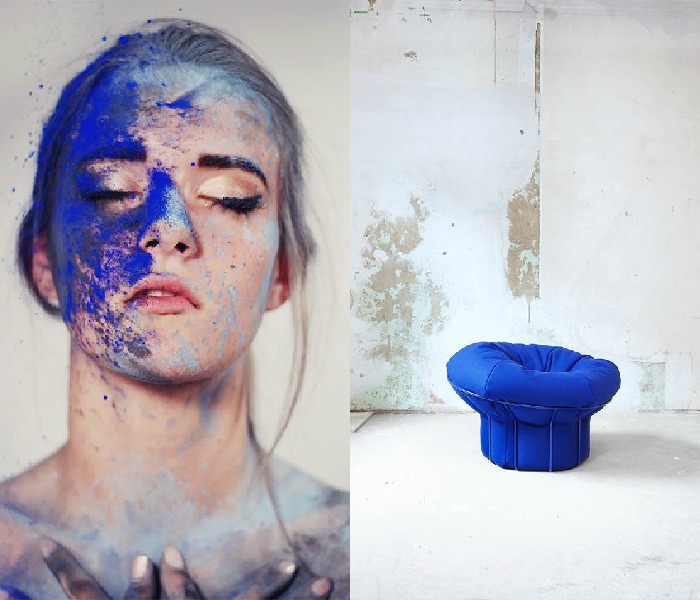 Also, the Klein Blue collage of our Color Inspiration Series has been the most shared to date!